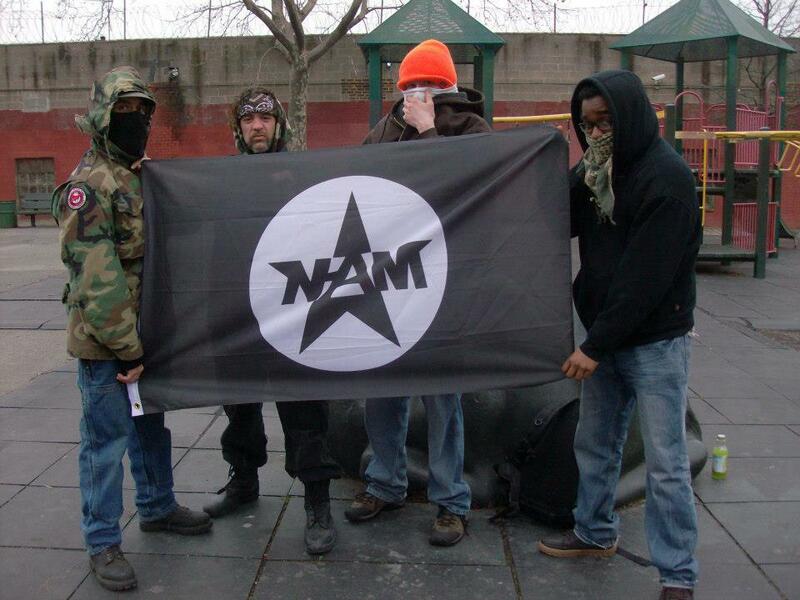 NATA-NY: Confronting Anti-FA NYC's Smear (February 16th, 2013). Please see below for a statement from Gabriel Brown. "Anti-FA proved to be totalitarian ~ Authoritarian Red Fascists 110% and even acted in the manner that the police act like by posturing themselves in the same positions as they do while giving the same responses and facial expressions the police give you when you try and speak rationally with them at a protest. "These people had absolutely zero common sense or were capable of judging a situation for what it was since they were drones programed with an OD case of political correctness while using tactics to intimidate people by verbally threatening them as well as attempting to use physical intimidation by attempting to shove a member of NATA-NY down a stair case in a violent manner to "remove" them from the entrance way. Then they dare tell us we have no right to be on a public side walk as they get in posture as if they are physically going to remove us from a public side walk if we choose not to leave. Childish clowns with no class to the end of their fascists threats against us. "These people were certified fascists, clownish, childish, intellectually dishonest, and were anything but adult or rational about the entire situation. I guess they never learned a thing or 2 about manners or civil discussion which is exactly why i do not take them serious at all or have any ounce of respect for them ether. "Red Fascist Action is not going to get rid of NATA-NY any time soon because NATA-NY will never give in to their clownish tactics of intimidation or threats. While they are reactionary and fearful of everyone, we will focus on doing positive things for the future that make Anti-FA irrelevant to all of our lives. NOTE: The NY Antifa smear article is discussed in the official N-AM facebook group here and in the NATA-NY group here.